Controversial city pastor James Ng’ang’a spent yesterday night at Central Police Station, Nairobi after being arrested by police for fraud. The pastor was arrested for allegedly defrauding a businessman of Sh3.5 million. He was later released on Friday morning on a police bond and is set to be arraigned in court on Friday. He was released on Sh200,000 cash bail. The arrest comes almost a week after the pastor retreated to the wilderness in Kajiado for a month-long prayer session aimed at praying for Kenya. Video In the video, the pastor is seen bathing with soil and walking around while praying. He took a camera man to document everything which will probably be shown on his church’s TV station. Also, in March, he was charged with threatening to kill journalist Linus Kaikai. Kaikai, who is the Strategy and Innovation Director at Royal Media Services (RMS) had gone after rogue pastors and demanded that religious organisations be regulated. 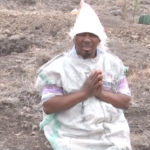 The post Pastor Ng’ang’a’s prayers in the wilderness cut shot. Arrested for allegedly defrauding businessman Sh3.5 million appeared first on Ghafla! Kenya.